I had seen him before, although I had not “noticed” him. He was just the class clown of-a-guy with bleached white tips in his hair, the one who was really loud and always drew a crowd. Not my type. We were in a class of 107 students going through YWAM’s “Discipleship Training School” in 1998 and I was more of a wall-flower girl. And if it hadn’t been for the ashtray, I might have been right. Let me back up. A couple of years before I went to YWAM my little red Honda Civic had been broken into. My window was smashed out and all of my CD’s, along with my CD player were missing, oh and the ashtray. Why anyone would steal the ashtray still baffles me, but they did. So I drove in silence and without an ashtray for the next two years. At some point I saved up enough money to purchase a new CD player and have it installed, but didn’t waste the money on replacing an ashtray I would never use. By the time Nathan and I returned for our secondary YWAM training school we were acquaintances. We had mutual friends and always seemed to get grouped together on local ministry outreaches. We spent time serving at a local hospice house for HIV infected people and even spent a week in New Orleans together learning about urban ministry, though we seldom interacted or even noticed each other. And then we unknowingly signed up for the same ministry outreach team that would travel across the western states and up into Canada for over a month. We spent the next several weeks in a 15 passenger van becoming friends. I was fasting from make-up in an effort to seek God only and His opinion of me without regard to what guys thought and God was setting me free in a lot of ways. For the first time, I wasn’t trying to impress anyone or seek my identity in a relationship. And that’s how he became impressed with me. All I knew, was that he was the funniest person I had ever met. I mean snot and tears kind of funny. I had never laughed so hard in my life as I did with Nathan Fair. And then I noticed how he loved people. All of them. The lovely, the unlovely, the underdog, the loner; he made everyone feel important. He made everyone feel like he was excited to see them. And he was kind to children and animals. And did I mention he was funny? His heart was beautiful, simple, straightforward, love. And he became my best friend. And we were friends. And we talked and laughed and got to know each other and it never occurred to me that I might be talking to my future husband. Because we were “buddies” you know, but he was just the class clown sort of guy and I was expecting…what was I expecting? And then one day I was sitting across from him at lunch and it was as if God removed a blindfold. I was looking at Nathan as he talked about whatever thing he was talking about and I realized I loved him. I realized that he was the first person I wanted to tell when something exciting happened, he was the one I thought to call first and relive my day, he was the one I went to when I was struggling or feeling down, and he was the one who made me laugh like no other. It hit me that he ALREADY was everything I wanted in a husband, and he was sitting RIGHT IN FRONT OF ME. And it scared me and made me feel like Jell-O on the inside and I was overcome with the whole revelation. So I stayed away for a few days while I prayed about what to do. I was in agony. My thoughts went something like this: ” What if I tell him I have feelings beyond friendship and he turns me down? It will ruin our friendship and things will be akward forever!” or “What if he says he feels the same way and then something goes wrong and it ends badly, then I will lose his friendship..” , “No, I can’t say anything, I’ll wait for him to say something.” “No, if I don’t say something he might not say something…then what?” So, I tormented myself like this for a few days, then came out with it. Yep, I did. And he said he felt the same way. J And then he said he was glad I told him because he never would have spoken up for fear of losing our friendship. And then we took a month apart and prayed. Because we had both done things the wrong way before and we had both had our hearts smashed to pieces and we knew we didn’t want to start this deal if it wasn’t for forever. And right about now you’re wondering about the ashtray. So, we were apart and I freaked out. And my thoughts went something like this: “He is too valuable to me as a friend to lose, I don’t think we should chance it because one of us will probably get hurt, so I am going to tell him when I see him that I’ve changed my mind.” And I decided that would be best. He was coming back from out of town the next day and I had resolved to tell him all of this. When I got off work the next day I was dreading confronting Nathan. My only hope was that we would still be able to maintain our friendship despite this blip in the road. I walked down to my dorm room on the base and plopped down on my bed and there was a box. Love…how can it be quantified, expressed, tamed or achieved? This wonderful, horrible thing, love; haunts, drives and controls us. So how can love be expressed? A flower, a kiss, romantic words? NO I SAY!!! One thing throughout the ages has remained true. This one thing brings an intimacy unrivaled by all else. It bridges the seemingly insurmountable gap between man and woman, puts to rest the endless battle of the sexes and joins the two as one. The ashtray, overlooked by many, utilized by few, is a true expression of love in its purest, unmolested form. Love it, cherish it, and true oneness will be attained. WOW. What a weirdo. I LOVED IT!!! And it was then that I knew I wasn’t going to have that conversation with Nathan after all. We were going to be okay. I just needed to trust God and follow His lead. And so I did, and I have never regretted it even once. And that is how the ashtray saved the day. Happy Twelve year Anniversary Nathan! I’d do it all over again in a heartbeat. Phoebe is Home for Christmas! 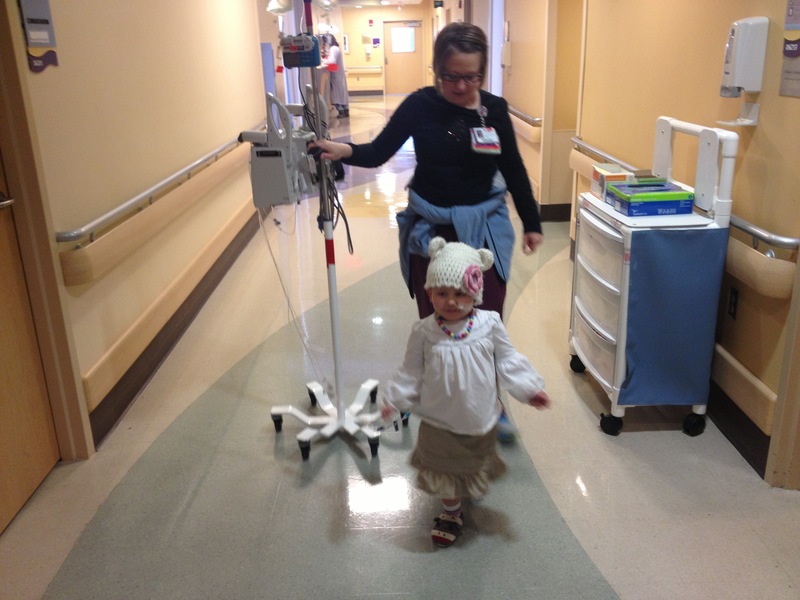 Today Phoebe walked down the hospital hallway without a walker for the first time since February. She is doing very well and finished her round of chemo today. If everything goes well we’ll be home tomorrow. What a difference a week makes. So far this round of chemo has been fairly uneventful. Of course, seven or so days from now her counts should bottom out, so it will really be obvious at that time how she’s doing with this cycle. Phoebe’s sodium numbers have stabilized this week and we even got some answers about her kidney issues. Nephrology stepped in and gave us some insight from their perspective after her urine tests came back and showed large amounts of Potassium being dumped. We have known that Phoebe’s body was not absorbing Potassium and have been supplementing her twice a day with large amounts to keep her numbers stable. We also knew that this was likely a kidney issue and have been told that these issues often correct themselves once chemo is completed. About a month or so ago Phoebe was diagnosed with a nasty UTI infection. The kind of bacteria that caused the infection is extremely resistant to antibiotics and therefore must be treated with high dose, IV antibiotics that can also cause kidney damage. It appears that Phoebe’s tubules sustained some damage, possibly temporary, that have caused Potassium dumping. The low Potassium messes with her sodium and on Sunday her Potassium was dangerously low, which in turn helped her sodium become dangerously low, which caused her seizure. It’s all a mess. This week they have started Phoebe on a new drug that helps the body isolate and retain Potassium and we are hoping to see good results once it kicks in. This is big stuff..and it’s big because we can’t manage her sodium at home if her Potassium is a wreck. Although there are blood sugar testing kits for people with sugar Diabetes, there currently exists no such testing tool for blood sodiums. So, aside from taking her to the lab every day to have her port accessed or blood drawn, we can’t track her sodium in a predictable way if her Potassium issues continue. Please pray for balance in her sweet little body. Electrolytes need to come into line. Kidneys need to heal and be restored. Tonight is her last night of chemotherapy and typically she would be released to come home tomorrow, but with her current electrolyte issues she will stay a bit longer until everyone is confident we can maintain her stability at home. 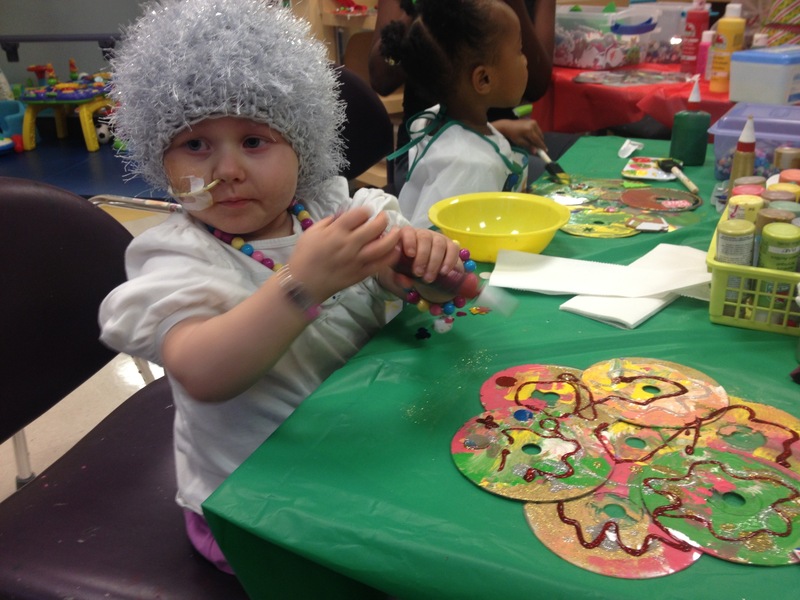 She enjoyed a visit from her 2 favorite PT’s ever, Erin and Anna, and had lots of fun at the Christmas party in the Oncology playroom. 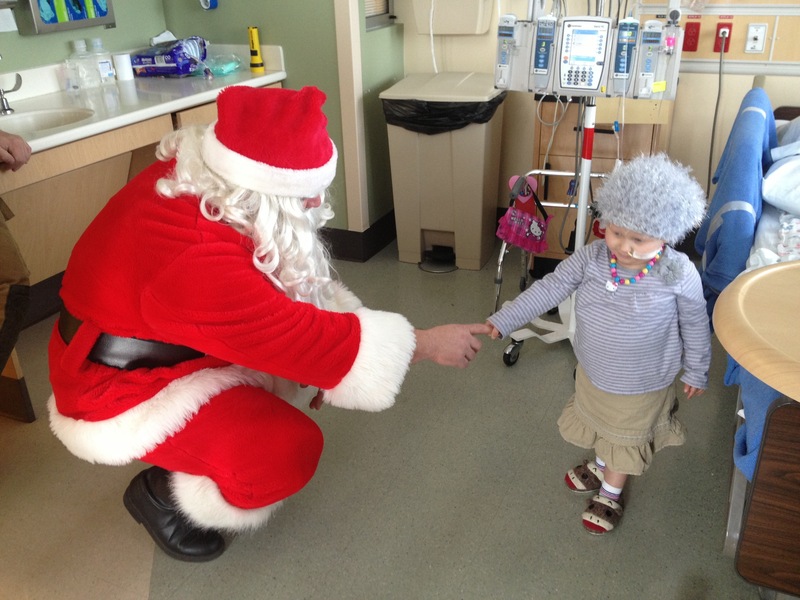 I am always blessed and so impressed with Children’s Medical Center and how they go out of the way to make these kids feel loved and valued by creating a warm and fun environment for them while they are going through the toughest season of their lives. It ministers to my spirit to see so much goodwill and to see so many people loving on my girl. I also want to say thank you to the life-group from The Village church who has been bringing meals, coffee, and treats for our family. Your hospitality blesses us more than you know and makes our hospital stays more bearable. We are lying low this week after fighting off a tummy bug. Deacon and I seemed to take the brunt of it, and I am so glad Phoebe didn’t catch it. I have a lot of disinfecting to do before she comes home and we will be staying in a lot until Christmas is over, in hopes that we can keep everyone healthy enough to actually spend Christmas together. I am trying to keep my expectations in check because I know her counts will be low right around then, and there is a very real possibility we could be in the hospital getting a blood transfusion or platelets. But, I am praying for a Christmas together..
Phoebe was transferred out of ICU when she was stable enough this afternoon. 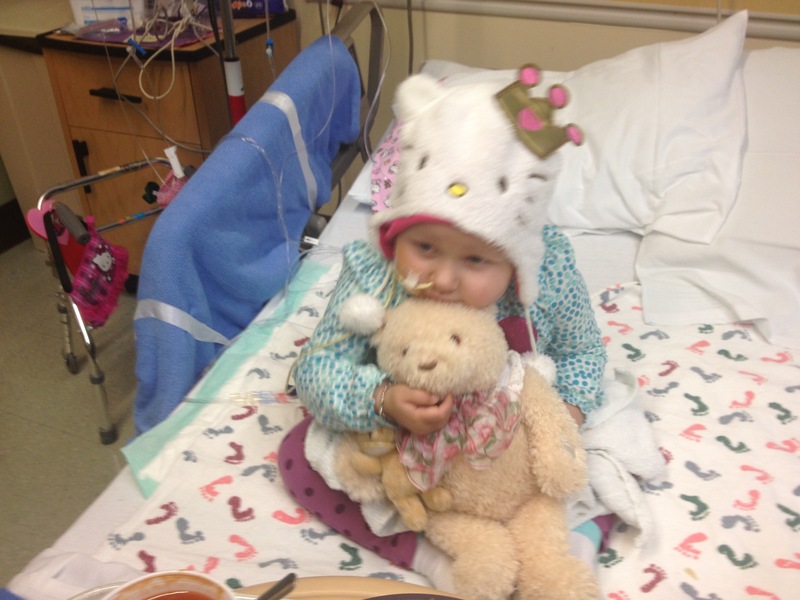 She is now on the oncology floor and receiving a unit of blood because her hemoglobin was low. We were scheduled to start chemo again tomorrow but we are waiting to see if her kidneys can handle it. We will be here on the oncology floor for a while. She is feeling a little puny but we hope that this blood transfusion perks her up. 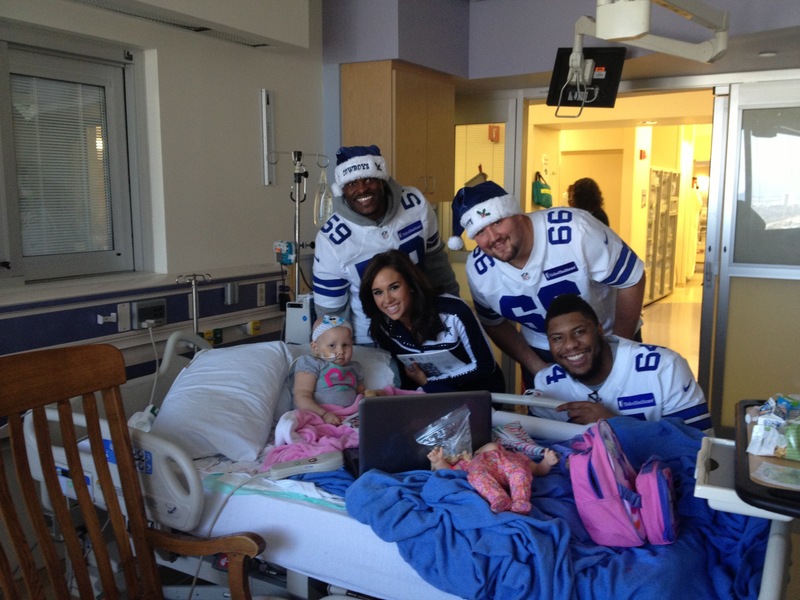 She even got to meet some of the Dallas Cowboys in ICU today! At 8:45 this morning Phoebe went into a seizure. She was watching cartoons on the couch with her brothers when Averic noticed that she was suddenly silent and foaming at the mouth. He ran to tell us and we immediately called 911. The seizure lasted for about 8 minutes with Phoebe unresponsive and locked in a sideward gaze while she coughed intermitently and shook. I knew immediately that her sodium had gotten too low. Last week her sodium numbers were extremely high; 166, 161 and so on, so we consulted with her endocrine team and began giving her more water and increasing her DDAVP dose (the shot of hormone that makes her kidneys hold on to fluid). Last night we went up one more time on her dose and apparently it pushed her over the edge into the danger zone. We were taken to the ER in Tyler where her labs were drawn, showing that her sodium was 129; eleven points lower than the 140 which is considered perfect. 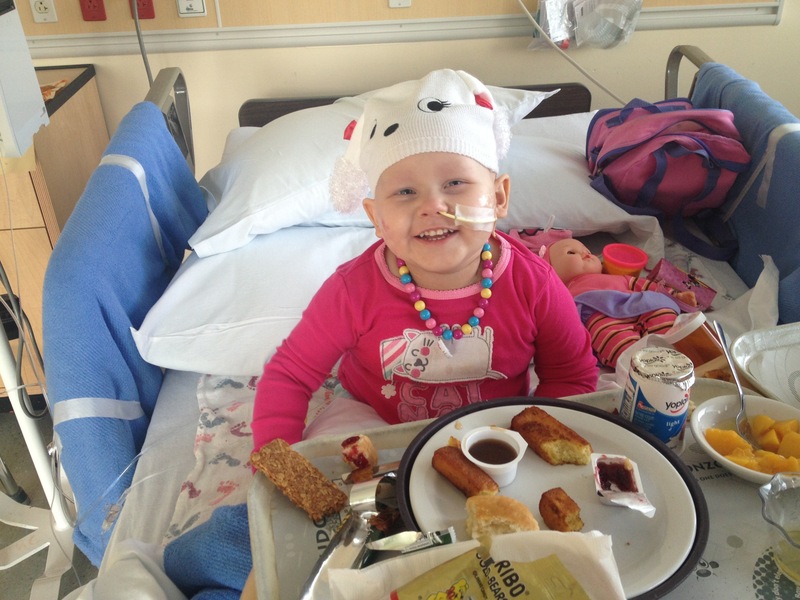 Her Potassium and Magnesium,which are all tied in to her sodium level, were also very low. Shortly after the seizure Phoebe began to come around although her speech was a little slured and she “zoned out” from time to time. After a couple of hours she was back to her normal self and told the nurse she was “going home to see Sadie (her dog) and Matilda (her cat). I love this girl. Unfortunately, Sadie and Matilda will have to wait, because we are now at Children’s Medical Center in Dallas. 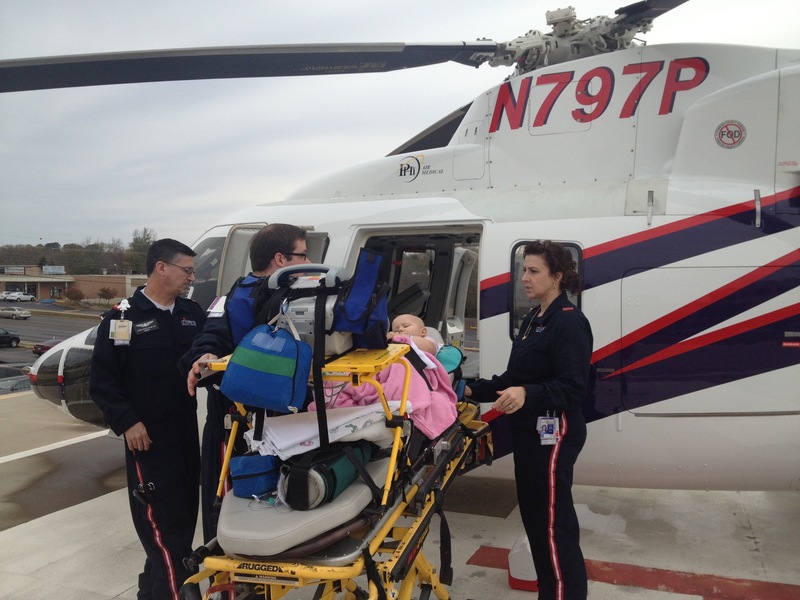 Because of Phoebe’s tenuous electrolyte issues and her past grand mal seizures, CMC sent their Care Flight Helicopter to Tyler and Phoebe got to take her first helicopter ride! Her sodium level is now 134 and climbing as we have removed her normal water feeds and she is only getting what she drinks herself. Hopefully we will be moved down to the oncology floor tomorrow or Tuesday when she is all leveled out. Just in time to start chemo. Poor baby has done a lot of hospital time lately. Most of all, Please pray for her stamina and that her joyful little heart will remain so.